Please bear with us as we remodel our website. Please keep your eye out for our annual mailers! Your support and contributions to our donation mailer has a significant impact on our 100% volunteer department! Thank you for your continued support, and may you all have a healthy, fire safe 2018. See any member to order!!! Pies are $6 each and are available for sale until October 31st. Orders will be available for pick up at the fire house November 10th from 10:00 AM to Noon. Drop off any paper products you have but please no cardboard or phone books! Also, please do not place any items outside the dumpster in the event it is full, Thank you!!! IF WE CAN’T FIND YOU…..WE CAN’T HELP YOU! 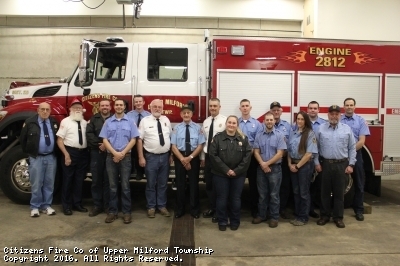 Citizen’s Fire Company of Upper Milford Twp. It’s 1:30 a.m. and the police department gets a report from a woman afraid there is a burglar in her home. She hides in a closet with a cordless phone and dials the dispatcher and gives her address to the dispatcher. Police arrive quickly to the neighborhood, but have trouble finding the residence because there is no visible house number. This is just an example of the many cases that can be pointed out by members of the Pennsylvania State Police, Both Upper Milford Fire Departments along with the Emmaus and Macungie ambulance corps. of the necessity for large reflective numbers on homes and businesses. We don’t want to risk the safety of an individual or police officer in such a case as above by having to walk around shining a flashlight at each home trying to find the right address. We prefer that people use at least 3″ numbers that are reflective for visibility at night. Many people have only small numbers for mail and paper routes which aren’t big enough for us to read at night. We would like people to have the larger two-sided reflective signs to make it easier to find the right home. We want to get the word out to people how important readable numbers are for safety reasons. A $15 sign or set of numbers isn’t much to spend for what could mean the difference between life and death. IF WE CAN’T FIND YOU…..WE CAN’T HELP YOU! Click Here to Download an Order Form and Mail Today! This site has been viewed 50,422 times.